Every charm tells the story of everything that makes her who she is and those cherished memories that she'll never forget. You know she's always wished for a bracelet that looks just like mommy's! Make her holiday wishes come true with her very own Adoré™ charm bracelet to get started on her collection of memorable charms! This trending bracelet is made with rhodium-plated 100% solid sterling silver. 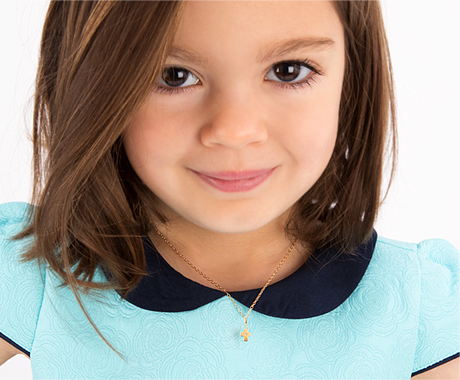 Because we designed this collection specifically for children, every charm and pendant will be easily interchangeable for her. Your little girl will love being able to create and transform this beautiful bracelet with such treasured and sentimental charms that this will become a keepsake for her that will be loved her lifetime over! Presented in gorgeous gift wrapping with a collectible Story Card, you can be assured that this is truly a gift deserving of your little princess. Exclusive Adoré™ styles, deigned just for girl's, only fit products within this collection. For detailed specifics of each charm, please see individual product page. A Girl's Heart Adoré™ Engravable Chram: 20mm total height.